Yes, the Third Congressional race suddenly has taken a severe turn for the ugly. No, it's not just the attack ads between Ben Ray Lujan and Don Wiviott. That stuff, despite cries of "Swift boat attacks," is to be expected. Let's talk about the unexpected. Things turned bizarre Monday night at a candidate forum in Farmington. And it came from -- of all people -- candidate Benny Shendo, who previously seemed like a soft-spoken, well-informed voice of reason. But in Farmington, Shendo let loose with a strange innuendo about Ben Ray Lujan's "lifestyle." "You say that you stand up for the people of New Mexico," Shendo said, "and I want to know how you can stand up for the people of New Mexico if you can't stand up to your mom and dad about your lifestyle." "If he is gay, and he's deceiving people, that's wrong. The voters have a right to be concerned about the deception — not whether one is gay or not. The issue is deception. That's relevant." The Lujan campaign calls the attack "despicable." 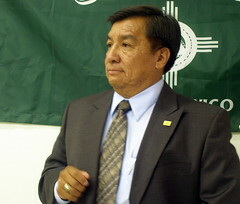 And Linda Siegle, a lobbyist for Equality New Mexico, said, "Whether he's gay or not shouldn't be an issue. Whether he has a girlfriend or not shouldn't be an issue. The issue should be the issues. Why would another Democrat be bringing this up?" No, it doesn't get much stranger than this. Read the whole story by Kate and me HERE.